Click the button below to add the Generac 7031 11kW Guardian Generator with Wi-Fi to your wish list. NEW 2018 WI-FI MODEL (SAME AS MODEL 70311). The Generac 7031 is run by The Generac G-Force Engine. This engine is pressure lubricated, stable and reliable, able to handle rigorous use, and needs less regular maintenance than most models. It operates at 63 Decibels, which makes it a quiet electricity solution for homeowners. The 7031 is Wi-Fi capable. 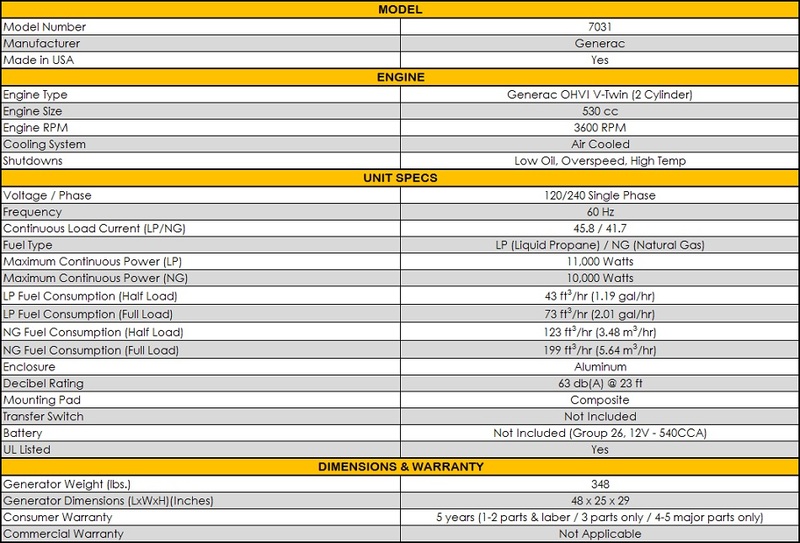 The Generac 7031 comes with a 5-Year Limited Warranty. The new Generac 7031 11/10kW Air-Cooled Standby Generator is a strong power option from the long list of reliable Generac models. It offers substantial electrical power that is clean and quiet for a home outage. This particular model has what it takes to run even a 3-ton AC unit, a well pump or water heater, and the rooms of a house. The electricity that this model delivers is suitable for sensitive devices and for the home overall. The 7031 is run by Generac’s G-Force engine. This engine is durable enough to work through constant use. It is also pressure lubricated and needs less regular maintenance that many other models. The unit weighs about 407 pounds and is 48” long, 25” wide, and 29” high. Its operates with up to 11000 LP watts and 10000 NG watts. Though Generac’s 7031 provides ample backup power to a house, this specific model does not come with an Automatic Transfer Switch. It runs quietly at only 63 Decibels, which is quiet enough to meet most residential noise regulations. It is still powerful; it can run all of the house’s most important items during a storm or outage. The Generac 7031 11/10kW Air-Cooled Standby Generator’s power is clean, too, thanks to True PowerTM Technology. This feature lessens harmonic distortion to 5% or less, which results in clean power quality, safe enough for sensitive appliances. The 7031 features technology to place it among the most modern units. A Mobile LinkTM Remote Monitor—a feature sold separately—allows the owner to monitor the generator from almost anywhere. All it requires is wireless service and a smart device, such as a computer, tablet, or phone. With these elements together, you can view the unit’s information on operation statuses, service requests, and more. This generator also has a Generac’s Evolution™ Controller that displays maintenance needs and battery levels, with several language options. Technology and more make it so that you don’t have to worry about your backup power. Additionally, these units can resist the elements; an Aluminum Enclosure and RhinoCoat powder-coated finish defend the generator against wear and tear, such as corrosion. This model will also survive storms with even 150 mph winds. Generac is proud of their units’ durability; all generators are constructed in the U.S. using domestic and foreign parts. Generac also takes pride in maintaining solid customer service. The 7031 has a 5-Year Limited Warranty. Generac provides year-round, 24/7 customer service to help you keep your backup power running at its best. I finally bit the bullet and replaced the portable generator I was using with this Generac 7033. No regrets. It works perfectly and after a recent 24 hour power outage I was glad I was not out in the elements filling up the portable. It was worth the expense. Completely satisfied with my purchase of Generac's 7031 11kW generator. Easy install. Price was great they even threw in a free battery. No problems for my local electrician to install. Works great. I also bought the remote monitor to go along with it a nice feature to have. This generac 11kW was the perfect size for my hunting cabin in Michigan. I have had it for 4 months and lost power twice since installation. Worked perfectly and never missed a beat. Recommend. I ordered from this website because they had the best price. Shipped same day I ordered it and arrived quickly. Works great as well. I would order again. Great generator. I received great techinical support from AP Electric in selecting this generator to make sure it was the right size for my use. Shipped quickly and arrived sooner than expected. I would order form this website again. This Generac 11kW was the perfect size for my house. Arrived quickly and AP Electric provided excellent tracking so I knew when it would arrive. Trucking company even deliverd to the top of my driveway. This Generac 7031 11kw generator was the perfect size for my hunting cabin where it is not essential that we power up all the circuits. Dom at AP Electric was able to answer all my questions prior to purchase. No issues with the order at all. Satisfied customer.